The Cat and the King: I think I might have found a new hobby. I've really been doing a lot of bicycle riding these days, and figured I ought to start sharing my experiences. First, we'll cover some history. 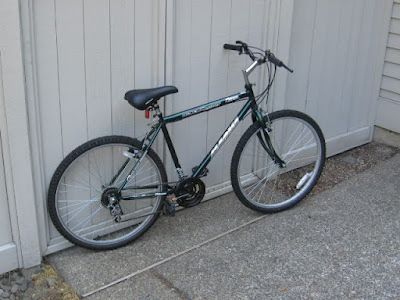 Back about 5 years ago, I got a bike at a local garage sale - $25 for a 15 speed 26". A Magna Glacier Point. The intended purpose was to ride the bicycle to the corner store for beer and cigarettes, instead of driving. So, after a few years of riding that bike, I found another 'garage sale special' bicycle. 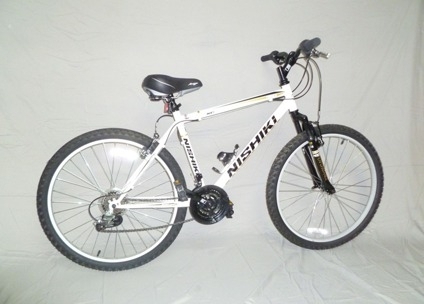 For $50 I picked up a Nishiki Pueblo. It had a front shock, 21 speeds that all worked, and I thought it looked much nicer than the Magna. I have put many hundreds of miles on this Nishiki, and even a few upgrades. I'm now looking for a dedicated touring bicycle. I intend to chronicle my bicycle progression here.